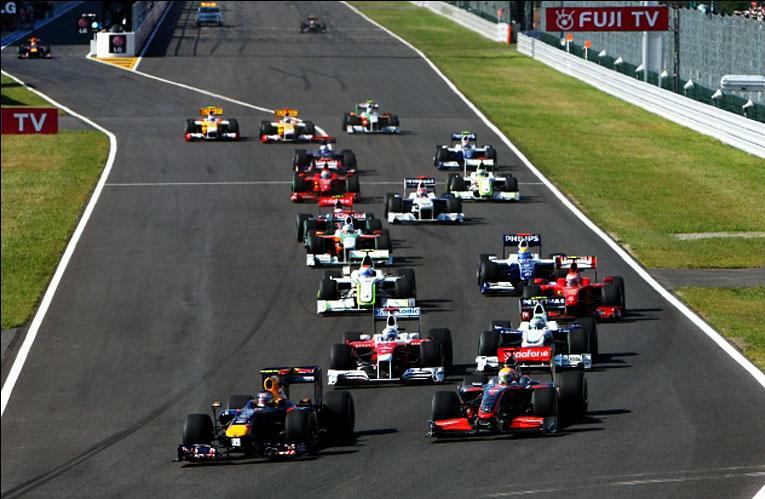 Japanese GP qualifying was postponed on Saturday till the early morning of Sunday under sunny and pleasant weather. The qualifying happened without any incident; RedBull takes the front row with Vettel on pole and Webber on 2nd, while Hamilton of McLaren on 3rd but suffering from a gearbox penalty that earned demotion to 8th on the grid. Subsequently drivers behind him from 4th to 8th promoted one position upward. Hence Kubica got 3rd, Alonso got 4th, Button got 5th, Rosberg got 6th, and Barrichello got 7th on the starting grid with Hamilton 8th, Hulkenberg 9th, Michal 10th. Heidfeld on 11th, Massa on 12th, Petrov on 13th, Kobayashi on 14th, Sutil on 15th, Alguersuari on 16th, Liuzzi on 17th, Buemi on 18th, Kovalainen on 19th, Trulli on 20th, Luca Di Grassi on 21st, Glock on 22nd, Senna on 23rd and Yamamoto on 24th. Crashes are a part of F1, but sometimes crashes just look a bit odd as it was the case with the Virgin GP driver Lucas Di Grassi as he crashed on his way to the grid even before the race starts at the 130R and was not being able to start the race. The race start displays chaos as first Renault’s driver Petrov bangs wheels with slow starting Hulkenberg sending Petrov’s car in the barriers while Hulkenberg also retires. The same spot from the previous race, and just before the first corner Massa from Ferrari move on to the grass trying a wild and reckless overtaking move and hits Liuzzi’s Force India taking out both the cars at the same spot from the race, Safety car was deployed to remove the debris from the track. Kubica at the race start was able to split the RedBull duo by placing his car on 2nd and pushing Webber down to 3rd but all his effort were in vein as his race was over 2 laps later under the safety car. On lap 2 his right rear wheel parted from the car because of a loosely bolted nut and he retires ending Renault’s race completely. As soon as Safety Car pulls in at the end of lap 6 and racing restarts, Michal overtakes Barrichello around the outside of the triangle chicane to take 7th. While Vettel was beginning to put fast laps and increase his lead over Webber and other drivers, Rosberg tries a bold move against Buemi around the outside of 130R but goes wide on the artificial grass and almost loss control of the car before regaining it and avoiding repeating the same mistake that Lucas Di Grassi did before the race start. On Lap 14 Kobayashi makes his first of the several amazing overtaking moves into the hairpin against Alguersuari to get to 10th, although this is the most wild move out of his all overtaking moves as he slides and drift to get the position in doing so, he bang the wheels with Alguersuari’s car but neither car suffer any damage. Yamamoto makes a great start passing Glock, Senna and Trulli for 15th position but later made a slight error on lap 16, handing the lead to Trulli. On Lap 19th Kobayashi made his second overtaking move against Sutil to take 9th at the hairpin again. On lap 23, first of the front runners; Hamilton goes in the pits for his scheduled stop, and came out behind Kobayashi, at the same time Barrichello takes his pit stop and came out 4.5 secs behind Heidfeld. A lap later Michal goes for his scheduled stop and emerges on 9th while on lap 25 race leader Vettel and Alonso pit for their scheduled stops and Webber takes the lead. But just for one lap as on lap 26 he goes for his scheduled stop, while Hamilton makes a brave move against Kobayashi to take 5th position on the start/finish straight. Button was leading the race with his completely different strategy as he chooses to use Hard-Tires at the race start unlike other top 10 drivers who started on Soft, he was being chased by Vettel and Webber with Alonso on 4th and Hamilton on 5th. Kobayashi was on 6th, 10 seconds ahead of Rosberg with Michal on 8th and Sutil on 9th and Barrichello on 10th. Kobayashi has also started the race on hard tires and starting to loose time by lap 33 as is the case with Button, by lap 35 Vettel was on tail of Button with Webber behind him. By lap 38, Hamilton has Alonso in his eyesight and a chance of a battle between the 2 drivers for the podium was very likely. Button pits on lap 40 and came out on 5th behind Hamilton while Kobayashi also pits on the same lap and came out on 12th position behind Alguersuari. At the same time, Hamilton told his team about loosing 3rd gear as he’s starting to loose pace, he was really struggling coming out of the hairpin, as Button starting to close on him. Kobayashi close the gap on Alguersuari as they were both trailing Sutil on 10th. On lap 45, Hamilton was being passed by his team mate Button for 4th while a lap later Kobayashi make his 3rd move going around the outside of Alguersuari to take 11th at the hairpin, while Alguersuari made some contact with him. Sutil retires a lap later with a blown engine at 130R leaving a trail of oil from 130R to the pits as Kobayashi takes 10th, Alguersuari also pits for his damaged front wing that he suffers during contact with Kobayashi. On lap 50 Rosberg retires when his left tire fails in the S-Curves sending him in the barriers at high speed. Kobayashi takes another position as he tries his favorite move against Barrichello at the hairpin; he is now up to 8th with Heidfeld just ahead of him, whom he overtakes a lap later to take 7th. Vettel posted the fastest lap of the race on the penultimate lap as he began to cruise to his second consecutive victory on this circuit but his team mate Webber posted the fastest lap on the last lap and takes the honor from his team mate again just like last year. FIA hold a post race investigation for the 2 incidents at the race start, for Petrov/Hulkenberg incident, Petrov was penalized for causing an avoidable contact handing him 5 place grid penalty for the South Korean GP, while Massa/Liuzzi incident was deemed a racing incident and no penalty was awarded. The championship is now most likely been turned into a 3-horse battle as McLaren fails to get better results but with the kind of season we have, it is still possible to see them back in the hunt after the next race which will be held on a completely new track for every team and whoever gets the setup right will gain the upper hand. The point difference between the top 3 is only 14 points as Webber leads the championship with Alonso and Vettel on 2nd with equal points, Hamilton is 28th points behind the leader with Button further 3 points down on Hamilton.